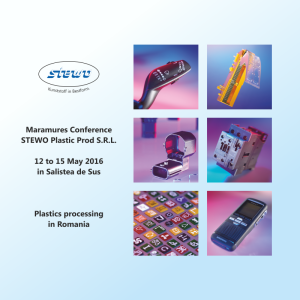 On Thursday the Maramures Conference starts under the heading „Plastics processing in Romania“. Customers, suppliers and network partners from different industries meet here, the connection of them is in the plastic. The host STEWO Plastic Prod S.R.L. has compiled an interesting and varied program for the participants. The day of arrival get in the mood for theme of the event directly after the greeting. Guests expected a tour through the production in Nasaud. The participants can gain a taste of practice, which will be discussed at the following day in the Forum. Then all go together to Salistea de Sus in Maramures to the conference venue, where a special reception committee is ready. The dinner closes the program of the first day. The insightful forum day concludes then with an evening barbecue spectacle with a tasty buffet with Romanian national courts and a special program. Saturday is dedicated to the national culture and landscape of Maramures and Romania – in the footsteps of the ancient traditions. In this context, it certainly will be easy to internalize and discuss the experienced information of the previous day. In the morning the participants embark on a guided museum tour. In the afternoon waiting horse-drawn carriages on to transport the guests during the quaint landscape to a traditional farmstead. Sunday the conference ends with check out, adoption and transfer back. The organizers are looking forward to a successful event with good conversations.